The smaller of Boston's two convention centers, next to the Prudential Center, has numerous good hotels nearby, in all price ranges. The John B Hynes Veterans Memorial Convention Center is the smaller of Boston's two convention centers (the other, larger one being the Boston Convention & Exhibition Center in the Seaport District). The Hynes is right next to the Prudential Center complex of offices, shops, hotels and residences on Boylston Street in Back Bay. 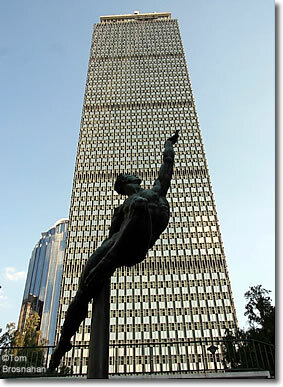 The Prudential Tower is right next to the Hynes Convention Center in Back Bay, Boston.